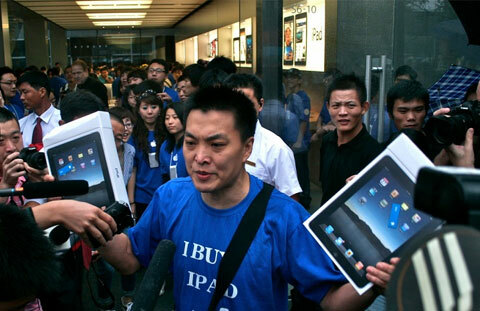 Apple’s world famous tablet was launched in China yesterday (17th September) and as expected, Chinese consumers lapped up the device as soon as stores opened their doors Friday morning. Fans were reported camping outside Apple stores for almost three days before the launch and braved rain and heat to make sure they didn’t lose their place in the long queues. One customer was featured on the news for standing outside a store for 60 hours. Retail employees for the Cupertino, Calif., company were on hand to distribute umbrellas, coffee and water to those waiting in line outside of Apple’s first retail store in China. The iPad prices in China start at CNY 3,988 (about $593) for the 16 GB model. Although the iPad 3G is currently listed as “Coming Soon” on the China Apple Store website, no date has been given for the launch. Apple also began taking iPhone 4 pre-orders with the iPad launch and needless to say, Chinese fans are hitting the website to place their orders in large numbers. China’s second biggest mobile service, China Unicom, will be bringing the iPhone 4 to the country and according to The Wall Street Journal; it’ll cost at least CNY 5,880 (about $875) and will require a two-year contract with China Unicom. This success of Apple’s 2 most popular products will further encourage the company to tap in to the massive Chinese market and develop a long term presence and relation ship with the Chinese consumers. Apple already plans to open 25 new stores in China over the next few years and now they might even add to this number. The iPad also made its debut in Argentina, Chile, Colombia, Ecuador and Peru on Friday.